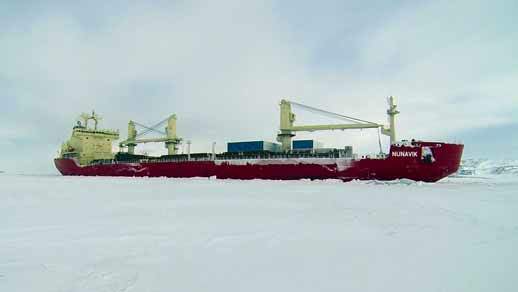 On 19 September 19, Fednav, a Canadian-owned company and world leader in Arctic navigation, announced that its vessel, the Nunavik sailed from Deception Bay en route to China via Canada’s Northwest Passage, with a full cargo of nickel concentrate. The Nunavik will be one of the first commercial vessels to transit the Northwest Passage completely, and the first to do so unescorted with an Arctic cargo, and with Canadian expertise. The Nunavik is the most powerful conventional (non- nuclear) icebreaking bulk carrier in the world, and sails from Deception Bay, Northern Quebec year round, transporting product from the Canadian Royalties mine.The Nunavik was on course to deliver 23,000 tonnes of nickel concentrate to Bayuquan in China. The Nunavik was supported by a shore-based team of ice navigation specialists from Fednav and its subsidiary, Enfotec. The vessel will receive regular ice charts including real-time satellite imagery in order to operate Enfotec’s proprietary onboard ice-navigation system, IcenavTM, further enabling safe and efficient transit. The route to China via the Northwest Passage is some 40% shorter than the traditional Panama Canal route, and as a result, will reduce greenhouse gas emissions by more than 1,300 tonnes. “Fednav is proud to have designed this remarkable ship and to plan the first independent commercial voyage through the Northwest Passage,” said Paul Pathy, President and co-CEO of Fednav Limited. “It is through the extraordinary capabilities of the Fednav team, the ship’s crew, and its world-leading technology that we can undertake this journey with confidence." Fednav is an international shipowning company headquartered in Montreal. Its principal activities include the transport of bulk and general cargo worldwide.The company has offices in Antwerp, Barbados, Hamburg, Rio de Janeiro, London, Singapore, and Tokyo, as well as regional offices in Canada and the United States. Fednav also has terminal, logistics, ice analysis, and shipping agency services and divisions. It employs 260 people and nearly 2,000 crew members and stevedores.